Online Associates Degrees are post secondary college programs that could award an AA (Associate of Arts), AS (Associate of Science), AAA (Associate of Applied Arts) and AAS (Associate of Applied Science). Associates degree majors might help students prepare to pursue a career after graduation, or serve as a basis for additional education. After high school, online Associates degrees could provide a first stage of academic education. Most online associate degrees entail about 60 course credits, which could come out to 20 or so classes. Most online associates degree programs are founded on a core curriculum that could support or enhance the discipline-specific courses. Because they often involve less time and half the credits than Bachelors degrees, online associates degrees may be referred to as a “2-year degrees.” i That said, some schools do offer part-time programs which could help busier students extend their time to graduation. Admission requirements to many online associates degree programs at public community colleges typically requires a high school diploma or a passing score on the high school equivalency exam. Aside from public community colleges, one might conveniently work towards an online associates degree through private 2-year colleges, for-profit technical institutes, and many 4-year colleges and universities. i Make sure to refer to individual schools to see what you need to apply into the program of your choice. What Is an Accelerated Associates Degree? An Accelerated Associates degree online program is a course of study that could award an associates degree in less time than two-years. What’s the catch? Accelerated associates degree programs are often designed for students who have previous college credits under their belt. Those who receive credit for past college courses tend to then have fewer required courses to complete for their associates degree. As a result, it places them on a ‘faster track’ to graduation. If this appeals to you, consult with an academic advisor at prospective schools to verify the validity of transfer credits before you enroll. Keep in mind that ultimately, you should consult your specific degree program display to identify the courses required to earn a degree. Also, make sure if your goal is to pursue a specific career that you speak with an academic advisor. S/he may help you ascertain whether there are any other requirements to consider. Some online associates degrees could provide a stand-alone credential upon successful completion of the program requirements. Primarily, these programs could lead to either an Associate of Applied Arts (AAA) or an Associate of Applied Science (AAS) degree. You could think of them as programs where you might learn to apply what you know into real time. Whether it is to operate special diagnostic medical imaging or to convert architects’ designs into technical drawings. Typically, both the AAA and AAS degrees are intended as terminal degrees. This means that the courses aren’t necessarily meant to be transferred to a bachelors degree program. That said, if you do decide to continue your studies, some colleges may accept the credits from an AAA or AAS degree. Of course, it is always wise to consult an academic advisor. In both the AAA and AAS degrees, students could learn the basic technical skills and academic topics that pertain to their major. Usually, students take general education classes—such as mathematics, writing, and speech—as well as courses specific to a professional or trade-specific major. For instance, you could look for an AAS in nursing degree online. An online Associate of Applied Arts (AAA) degree is often planned-out to help students to gain skills and acquire some of the fine arts knowledge necessary to pursue a career upon graduation. The focus of an AAA degree program is typically on a performing or visual art. Therefore, you might find courses that are geared towards artistic training (e.g. advertising art). Most of the other coursework could come from general education courses in the humanities and social sciences. .
At a glance, some of the majors you might find linked with an online AAA degree are as follows. An online Associate of Applied Science (AAS) degree could provide students with the opportunity to gain technical, technological or science-based skills and knowledge. Whereas the AAA highlights fine and applied arts, the AAS focuses more on science and applied sciences. AAS degree programs generally require fewer general education courses. Instead, students could learn industry-relevant material such as medical insurance billing and coding. Some examples of areas where one might earn an AAS could include the ones listed below. Some Online Associates Degrees are specifically planned-out as the first step towards a bachelors degree. Hence, they are sometimes called “transfer degrees.” The two main transfer degrees are the Associate of Arts (AA) and Associate of Science (AS) degree. And, on the bachelors side, you might find programs labelled ‘degree completion’ or ones with adjectives like ‘faster track’. The words vary but tend to mean the programs are potential next steps after you have completed your associates degree credits. For either track, students could complete about half the credits they need for their bachelors degree (120 credits) through their AS or AA degree online. Coursework tends to include general education topics such as writing, literature, science or math. Also, some students might be ready to declare a major like graphic design and multimedia or a STEM degree field (science, technology, engineering, mathematics). It is important to keep in mind that an institution needs to have a transfer policy or what is sometimes called, an articulation agreement, in place. This agreement states that the school’s associates degree fulfills all the general education requirements of a bachelors degree. A few programs might also look beyond the bachelors, as in the case of some pre-pharmacy programs. I This could be important should you want to study to achieve your associates degree online, then work towards your bachelors degree at another school. Some universities and colleges may have “transfer-friendly” online associates degree programs. For instance, you might work towards an Online Associate of Science in Accounting at a specific school. Once you successfully earn your degree, you might roll over the credits into the (same) college’s online bachelor of accounting program. If this is your goal, you should ask your school for more details. With a good academic plan in place, an AS or AA degree program might prepare students to further study in their chosen field. For instance, students who earn an online associates degree in psychology might pave the way for a future bachelors degree in psychology. In turn, successful completion of a bachelor of psychology might turn into a platform for a masters degree in counseling or a Doctor of Psychology (PsyD). You see how this might work? Examples of this type of program could include also include an online associates degree in business or online associates degree in nursing. An online Associate of Arts, or in short-form, AA degree, is often used as a college transfer degree to a Bachelor of Arts degree program. Most programs require students to complete general education courses as well as courses that reflect their (liberal arts-based) major. AA degrees are often awarded in liberal arts and humanities disciplines. Possible AA degree majors might include areas such as the ones below. Some examples of AS degree majors are listed as follows. As a savvy student and ‘smart shopper’, you are likely interested in a few get-to-the chase comparisons. You may wonder whether to pass go and head straight to a bachelors degree program or which associates degree online program could align with your personal and professional goals. What’s the Difference between an AA vs AS Degree? If your deliberation is associate of arts vs associate of science, the differences could be found in the curriculum makeup. While both the AA and AS degree programs could require students to complete 60 credits, the way these credits are spent could indicate how the degrees differ. Since each school sets their credit and course requirements, please refer to individual institutions to see what their programs entail. The following is a general example. What’s the Difference between an AAS vs AS Degree? If you question whether to pursue an online Associate of Applied Science or an Associate of Science track, consider your career goals. In some cases, “applied” courses stress preparation for a specific type of career so they could focus on practical vocational skills. By comparison, the AA and AS degree programs target students who want to go on to a bachelor’s degree. Online associates in science degree programs might therefore emphasize preparation for higher levels of academic study. Beyond this, differences might be apparent in individual degree plans. As credits and courses vary between schools, refer to the colleges on your list for more information. Below is an example of how the AAS and AS degree programs might allot their courses. What’s the Difference between a Bachelors Degree vs Associates Degree? Both bachelors degrees and associates degrees are undergraduate academic options. One could enroll in either type of program with a completed secondary school education. Ultimately, the associates degree could prepare you for a bachelors degree, so it does not necessarily mean you have to choose one or the other. 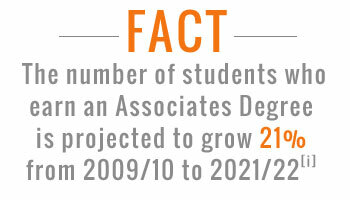 Why Earn an Associate Degree Online? While plenty of students may want to enter an online associates degree program straight from high school, others might be out of school for some time. If you are too busy to ‘get to class’, you could let the classroom come to you. In many cases, online coursework could be completed in a self-paced manner. This could be an asset if you are an adult with duties or an at-work professional who wants to earn a degree with minimal interruption. Usually, you receive and complete assignments through a web-based portal, and often engage with fellow students and faculty through various digital tools. Many regionally and nationally accredited schools offer accredited online associates degree programs. Accreditation is a voluntary review process that a school could choose to undergo at regular intervals. There are two types of accreditation that speak to different things. Program: Approved programs are ones that have undergone a separate process by a professional agency. For instance, the Commission on Dental Accreditation accredits some dental hygiene programs while the International Assembly for Collegiate Business Education (IACBE) accredits some business programs. Approved programs are found in accredited schools. Easily compare great online associates degrees on our vast directory. Here’s how. Use the on-page menu bar to select an area of interest at the Associate’s degree level. A list of paid programs that uses your filters is generated. Find a few you are interested in? Fantastic! Contact schools right away – all you do is request information about the online AAA, AAS, AS or AA degree programs on your list. Still can't decide? Check out the differences between an associates and a bachelors degree here.